You might say, and many have, that in 1986 Art Spiegelman’s Maus revolutionized the late-twentieth-century cultural perception of comics and the entire graphic novel genre. 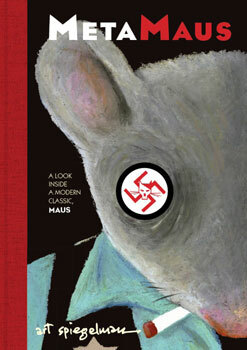 Since the first volume appeared, followed by a second in 1991 and a special Pulitzer Prize for both volumes in 1992, Maus has been a phenomenal success, critically and financially, and has been translated around the globe and made its way into a variety of educational curricula. Numerous critical theorists have addressed Maus, its narrative and its drawings, but now, with the appearance of MetaMaus, Spiegelman himself examines his own work abetted by Hillary Chute, an academic who has written a good deal about Maus and graphic novels. It is rare for an author to examine his own work in such depth; most would say, “Let the work stand on its own.” And it’s axiomatic to take what a writer says about his work with many grains of salt. But Spiegelman has produced in MetaMaus not a vanity project but a remarkable document detailing his inspirations, both artistic and historical, along with his analyses of the way in which he layers information via text and image and his theories about high and low art. MetaMaus is constructed primarily around Spiegelman’s interviews with Chute. Interspersed are timelines, charts, early drafts of Maus, period photographs and advertisements, drawings by other comics artists, and the complete interviews with Vladek, Spiegelman’s father, whose story Maus depicts. As such, given its fragmented nature, this may not be a book to read straight through but one to dip into; yet each of the three major sections holds the reader rapt. There is also a nod toward technological interactivity in the packaging of MetaMaus, but the included DVD has a few technical problems, such as static interruption in Spiegelman’s audio musings. Also, for me, reading Maus on the screen lacks the tactile depth and richness of the printed work. But for a reader who likes the screen, or an academic seeking a complete concordance as well as easily accessible ancillary information, the DVD is quite useful. What is most delightful is the pleasure of discovering how perceptively intelligent and articulate, as well as irreverent, Spiegelman is. When asked by a reporter in Germany if he felt a comic book about Auschwitz was in bad taste, he replied, “No, I thought Auschwitz was in bad taste.” Moreover, his explanation of narrative time and architectonics in Maus and his incisive examination of how visual and narrative elements relate will challenge anyone who questions the high, and sometimes antic, seriousness of graphic novels or their creators. Even the title is an ironic nod to contemporary criticism. It is true that this volume cannot stand alone—it needs Maus to exist. But if a reader is fascinated with Maus, MetaMaus is a treasure trove. What a joy to have them both. 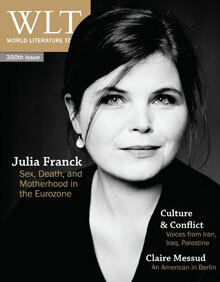 WLT celebrates its 350th issue with features on contemporary German-language women writers and authors who overcome obstacles of political upheaval and censorship in Iran, Iraq, and Palestine.